I’m officially calling for an end to the Information Age. For the past 60 years or so, we’ve made outstanding progress with information. Ever since we transformed the nature of information from something fixed and static to something fluid and dynamic, we’ve opened up whole new worlds of opportunity for its creation, transmission, storage and retrieval. We have become highly efficient at producing tools for generating content, establishing platforms for publishing, and designing systems for archiving, searching, and sharing information. The fact that we can now interact with so much information in so many ways using so many different devices (most of them portable) is a staggering achievement. In a sense, this is information’s Golden Age. But we pay a steep price for all these advancements. We continue to struggle with the growing volume and complexity of what we create. Whole industries have formed for the sole purpose of managing information, from information technology to information science, but these efforts suffer from their own self-perpetuated complexity, like ever-changing standards, elaborate systems design, and cryptic jargon. We now suffer from information overload, information anxiety, infobesity, and other info-ailments. On the flip side, some of us welcome the deluge and become hooked on the steady stream of information available to us, giving rise to the infovore and information addiction. In the case of either too much or not enough information, our attention spans have shrunk, our concentration has become fractured, and our memory has been offloaded to a hard drive somewhere. Along with these challenges, the quality of information design and delivery has fallen short of people’s real-world needs. We may possess better tools and techniques than ever for presenting data and packaging information, but the results still favor the form of information rather than the function, or as Richard Saul Wurman would put it, the performance of information. We’ve grown too accustomed to the idea of having designed information pieces and online experiences do all the heavy lifting of explaining something, but we overlook the shortcomings of the artifacts we create, placing the burden of figuring it out on an already overloaded audience. We’ve been too deeply enamored with the technical and technological aspects of information, all the while neglecting to adequately bridge the gaps we’ve created in human understanding. It’s time to usher in the Understanding Age. Just like the resurgence of classical learning and ideals in the Renaissance and the triumph of scientific reasoning during the Enlightenment, the Understanding Age will bring about a renewed focus on human needs in communication and a deep appreciation for sensemaking and teaching skills. The key to the Understanding Age will be the adoption of information design thinking skill as an essential universal capability, like math, writing, and logic. Professional information designers won’t be the only ones expected to make sense of data or create organizing structures for content (although their expertise will remain vital to tackling complex problems). We all will need to become better explainers and start taking more responsibility for the way we communicate with each other, regardless of intent, discipline, or medium. Just imagine: instead of having to plow through scores of books, brochures, websites, and videos or make countless phone calls to family, friends, and “customer service” lines when you need help with, say, a healthcare issue, all the support you need could be available in one place or through one point of contact who would take the time to explain everything to you clearly. The information you’re looking for could be available precisely at the point of need, never too far out of reach. And none of it would seem unusual — it would just be the way things are done. Does this sound like an episode of the Twilight Zone? I could list many more examples of what an Understanding Age could bring about for education, business, government, and society, and build a better case for such a movement, but the benefits are readily apparent. If information design thinking became widely embraced and practiced, we might solve for many of the social and economic challenges we face today. The idea of an Understanding Age might be too aspirational, but some of the groundwork for this vision has already been laid. Information design, information architecture, and data visualization have grown in popularity and have slowly evolved into more recognized practices. The infographics wave, for better or worse, has raised awareness of information design by pushing it into the mainstream. Visual thinking as an enabler of understanding continues to gain traction. The continued popularity of design thinking and the growing formalization of user experience as a discipline have both helped to make user-centered design a priority for many businesses and organizations. Gradually, the importance of more mindful communication and the desire for skill-building to practice it effectively will catch on. If we can’t start the next chapter in history right away, we can at least try to make each other’s lives a little easier. Excellent! I agree on all points. 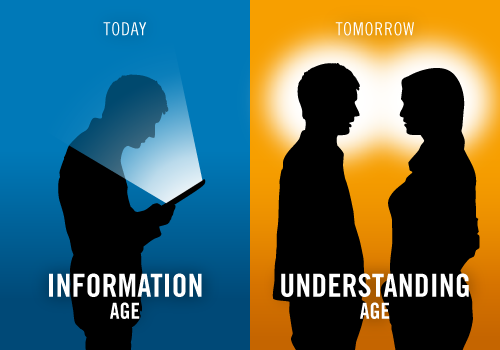 It is definitely time to shift away from the Information Age to the Understanding Age. The last point “never assuming anything” is very very important. I think it will throw society on it’s head as it will destroy convention. People will learn to think for them selves with the amount of information and will also come to think that misunderstanding and manipulation is possible. People won’t just not learn from the information around them. Its likely that brain implants and things like Google glass will start to really change how we see the world, human nature and the universe. The destruction of convention will cause a unparalleled boom in social change and will rid IMO the world of bad systems like the monetary, political and economic systems. There may not be a need for society as there won’t be anything to strive for. It should take a hundred years or so to come at this conclusion with massive change after AI takes control of the world and starts to completely replace humans from the systems. Anyway something big is coming in a few decades whether that be the age of understanding or the technological singularity. With all that “big data” something is going to happen and something BIG, REALLY BIG IMO.